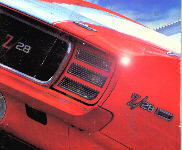 The Rally Sport package, RPO Z22, added several style options to the standard Camaro, the most noticeable of which were the hidden headlights. 1967 and 1968 RS Camaros used the same stlye grille and doors, but they were operated differently. The 67 doors utilized two electric motors, three relays, in line diodes, limit switches, a circuit breaker, and several other electrical parts. Needless to say, these doors could be less than reliable, and the problem was particularly bad in the north. Snow and ice would freeze the doors shut and the electric motors would burn out trying to open them. For 1968 Chevrolet switched to a vacuum operated system. This was not only more reliable, but more importantly you could still open the doors by hand if the system failed, and without damaging the system further. In 1969 the grille and headlight doors were changed. The doors now had horizontal slits in them so that if the doors stuck closed some light would still shine through. You couldn't really see like this, but it was a neat idea. 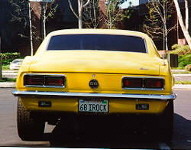 The Rally Sport also received separate back up lights mounted below the rear bumper instead of having them in the taillight assembly. There were also bright accents on the taillights and parking lights. Other RS features included headlight washers, fender striping, front and rear wheel opening moldings, bright accents on simulated rear fender louvers, bright roof drip moldings, and a black body sill. 1967 was the most popular year for the RS option, with 64,842 sold. 1968 sales totaled 40,997, and another 37,773 in 1969. Z22 Rally Sport Package; includes front valance mounted parking lights, electrically operated headlight doors, body lower side moldings, body side paint stripes, front and rear wheel opening moldings, roof drip gutter moldings (Sport Coupe only), black painted taillight bezels, rear valance mounted back-up lights, special grille styling and "RS" emblems on radiator grille, fender and gas filler cap. $105.35, 64,842 built. Z22 Rally Sport Package; includes special grille with vacuum-operated headlight covers, front valance mounted parking lights, lower body side moldings, belt reveal molding, wheel opening moldings, rear valance-mounted back-up lights, RS emblems on grille, fenders and fuel-filler cap. Sport Coupe also includes bright roof drip molding. $105.35, 40,977 built. Z22 Rally Sport Package; includes special black painted grille with concealed headlights and headlight washer, fender striping (except when sport striping or Z28 Special Performance Package is specified), simulated rear fender louvers, front and rear wheel opening moldings, black body sill, RS emblems on grille, steering wheel and rear panel, Rally Sport front fender nameplates, bright accented taillights, back-up lights below rear bumper; also includes bright roof drip moldings on Sport Coupe. $131.65, 37,773 built.